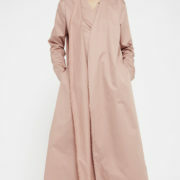 This long sleeved dress comes in a rosewood waterproof cotton. Combining layers, it is belted with a grey velvet ribbon, inspired by traditional Japanese fashion. Its side slits, its two hidden pockets and its raw finish convey a very casual and nonchalant attitude. It will be a unique piece in your wardrobe. You can wash in a machine at 30°C on “fragile” or dry clean. Do not bleach. Do not use a dryer. Iron the lining softly.